People have been going crazy over natural health, beauty, and skincare products lately. After being subjected to so many chemicals and unnatural health and beauty products as a society, it is nice to see so many companies and consumers focus more on natural options as these natural substances are much healthier for your skin and body than any chemical could ever be. As the natural health and beauty industry is just getting started, there are still many ingredients that have yet to be fully focused on and made known to the public; with that said, there are many others that have received a lot of attention for their many benefits and wide availability. 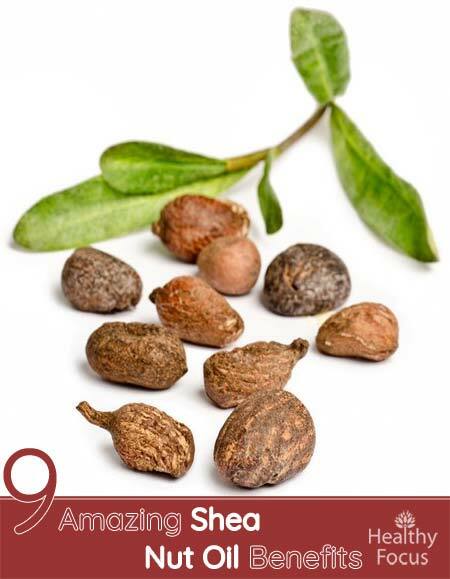 Today, we are looking at one of these natural products – shea nut oil. What Is Shea Nut Oil? Even if you’re not a natural health and beauty fanatic, you’ve probably heard of shea butter. Shea butter has often used a moisturizer or cream for both the skin and hair but did you know that it can also be used in the form of an oil? Shea nut oil and shea butter are both derived from the same nuts and tree, which is scientifically or botanically known as Vitellaria paradoxa. The shea tree and shea nut are native to Africa and the nuts have been used for thousands of years to produce extremely beneficial skin and health care treatments. Shea nut oil and shea butter are actually more closely related than meets the eye if that could be possible with two substances made from the same originating nut. The process of retrieving shea nut oil from the nuts of the shea tree is actually also part of the process of making shea butter from the same nuts. As the shea butter is being expelled, a small amount of thick and often cloudy oil is taken from the nut. Because of this, it’s typically much easier to create shea butter than it is to create shea nut oil as only a small amount is extracted from the nut while the butter is being made. Because shea nut oil is so rich in essential fatty acids, minerals, and vitamins, it provides many great benefits when used on both the skin and hair. It can also be ingested for added health benefits for the body. The oil is packed full of emollient, humectant, and anti-inflammatory qualities that make it great for medicinal ointments and creams that may be used to help heal the skin or reduce inflammation or irritation. The oil is also beneficial in treating skin conditions such as wrinkles or fine lines, stretch marks, dermatitis, and other skin blemishes; it may also be used to ease and alleviate muscle fatigue. Shea nut oil is also rich in other beneficial nutrients including Vitamin A, Vitamin E, stearic acid, and oleic acid as well as saturated fats, monounsaturated fats, polyunsaturated fats, caprylic acid, capric acid, lauric acid, myristic acid, palmitic acid, palmitoleic acid, linolenic acid, and phytosterols. The high amounts of Vitamin E, Vitamin A, and catechins found in shea nut oil make it a powerful antioxidant. These properties make the oil a great source of protection from ultraviolet rays and other environmental damages as well as a combatant against free radicals that damage your skin. 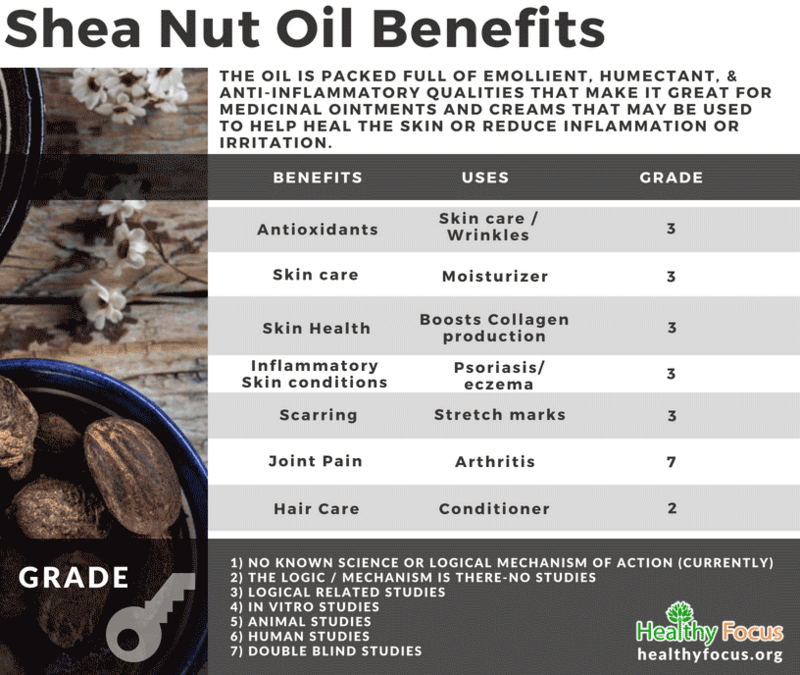 Overall, shea nut oil is also very beneficial in treating wrinkles, inflammation, acne, damaged or peeling skin, insect bites, nasal congestion, arthritis, and poor blood circulation. What is Shea Nut Oil Good For? Shea nut oil contains some excellent antioxidants in the shape of vitamin A and vitamin E. Antioxidants help to prevent damage caused by free radicals. When applied topically to the skin, antioxidants like vitamin E can do a great deal for the health of your skin and your appearance. By applying Shea nut oil to your skin, you can reverse many of the signs of aging, prevent and reverse skin damage and wrinkles. It can also protect against sun damage and is worth applying to exposed areas of your skin before you go out on a hot summer’s day. Shea butter contains fatty acids and other nutrients like vitamin E that help hydrate and moisturize your skin. By applying Shea nut oil to your skin, you will be forming a protective barrier on your skin that will prevent moisture from escaping. It is an excellent oil to use for people prone to dry skin. Shea nut oil can help increase your production of collagen. Collagen is protein that plays a vital role in the structure of your muscles, bones and skin. When applied topically, She butter can help boost your collagen level and give your skin better structure and elasticity. This will help your skin look and feel stronger, more alive and younger. She butter oil could also help treat people with common inflammatory skin conditions like psoriasis and eczema. The oil contains excellent anti-inflammatory properties which can help soothe irritation, reduce redness and swelling on the skin. These same anti-inflammatory actions make the oil a useful ally when dealing with minor cuts, insect bites and stings. It can also help soothe skin irritated or damaged by sunburn. The majority of women who have given birth will develop stretch marks as a result but people of both sexes can develop them especially if they have put on weight quickly. Applying Shea butter oil to your stretch marks regularly may eventually help diminish their appearance but there is no scientific evidence that it will work. If you have cracked heels or dry feet, try applying Shea nut oil to the affected area before bed. The nutrients found in the oil can help moisturize your feet and hydrate them fully. After applying the oil cover your feet with a pair of cotton socks overnight. Repeat until your condition has improved. Shea nut oil is often used in commercial hair care products because of its high content of hair friendly nutrients and fatty acids. It can help condition your hair, get the frizz under control and add volume to your locks. It may also help treat irritation and inflammation on your scalp. You can simply apply a little oil to your hair before you style it. Alternatively, you can add a few drops of shea nut oil to your regular conditioner and use it as you normally would. You can also apply it to damp hair and massage it into your hair and scalp then cover with a hot towel for 30 minutes before you wash your hair. Not only is Shea nut oil useful for the skin and hair, it can also help relieve inflammation and pain in the joints and muscles. People with arthritis and other inflammatory joint conditions can get a great deal of benefit from the oil. Because shea butter and shea nut oil are derived and created from the same source, the shea tree or Vitellaria paradoxa, it is easy to think that the two are entirely the same. While the two substances are similar, especially considering their origins, they have many differences and, because of those differences, one may often be more suitable for a person than the other. The differences might also help you determine which one might be better to use on your hair and which to use on your skin, depending on what type of skin and hair you have. Generally speaking, the biggest difference between shea butter and shea nut oil is the fact that shea butter is a heavy cream and shea nut oil is a much drier, liquid oil. When comparing the components of both substances, shea nut oil generally has a higher concentration of those nutrients in comparison to shea butter. Shea nut oil has 5% palmitic compared to shea butter’s 4%; it has 57% oleic acid compared to shea butter’s 45%, and it has 9% linoleic acid compared to shea butter’s 6%. On the other hand, it does have less stearic acid than its butter counterpart as shea nut oil only has 27% stearic acid compared to shea butter’s 42%. When comparing the concentrations of these nutrients, it can be determined that shea nut oil is typically more moisturizing than shea butter because of the higher levels of oleic acid and the higher percentage of linoleic acid might also help promote hair growth and treat skin conditions more efficiently. A comedogenic rating is given to natural substances to help a person determine whether or not that substance might be suitable for his or her skin. The ratings are given on a scale ranging from zero to five with zero meaning that the substance is the least likely to irritate anybody’s skin. Substances that are rated low on the comedogenic scale, otherwise known as non-comedogenic substances, are unlikely to irritate even sensitive skin and they also shouldn’t make skin conditions such as acne become worse after use. Generally speaking, substances that are higher in oleic acid will be rated higher on the comedogenic scale. Of course, this might not always be the case as can be proven by the comedogenic rating given to shea nut oil. Although shea nut oil has an oleic acid percentage of over 50%, it has still been rated between a zero and two on the comedogenic scale. Even though it does have a high percentage of oleic acid, it still doesn’t seem to clog people’s pores, which is why it has been given such a surprising rating. Is Shea Nut Oil Safe for People with Tree Nut Allergies? If you have a nut allergy of any kind, you’re probably very hesitant to try anything that says that it was created or derived from a nut, which is completely understandable and to be expected, especially considered how severe some people’s reactions can be after ingesting or being exposed to a nut. As shea nut oil and shea butter are both derived from the nut or seed of the fruit that grows on the shea tree, Vitellaria paradoxa, it is easy to think that these substances would be included in the list of things that you shouldn’t use or consume with a tree nut allergy. With that said, many extensive studies have shown that people who suffer from tree nut allergies have not had any kind of poor reaction to the use of either shea butter or shea nut oil. Of course, the results of those studies apply more to the consumption of the shea substances, not necessarily to topical applications. It may be possible that people with tree nut allergies could experience mild reactions to the topical applications of shea butter or shea nut oil but general research has shown that most people do not. If you have a tree nut allergy, you should speak with your doctor before using any kind of shea products or you could simply test out a small amount of the product on a small area of your skin to see if you have a reaction. Of course, you should certainly be careful with this and should never try an at-home test if you know that you are prone to severe reactions. When it comes down to it, shea nut oil might just be one of the most powerful natural oils out there and adding it to your daily skin or hair care routines could provide countless benefits; it could even be a great addition to your diet, as well. Because of how popular shea butter is and how much it populates the beauty and skincare industry, it can be easy to forget just how powerful its sibling, shea nut oil, can be. If you have tried shea butter but didn’t quite like how heavy it was or maybe if the butter didn’t work as well as you might have hoped, switching it out for shea nut oil instead could show you the results that you expected. Shea nut oil is richer in nutrients than shea butter due to its form and cold-press production so you won’t be missing any benefits if you choose to add this great oil to your daily skin or hair care routines.